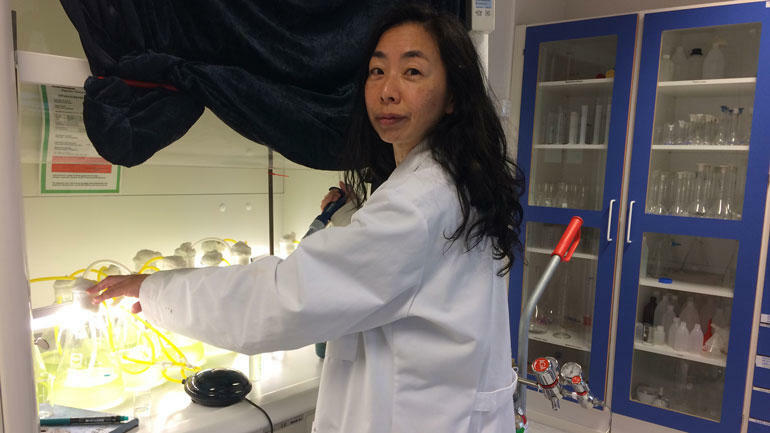 Ikumi Umetani disputerer 10. desember for doktorgraden med avhandlingen «Photosynthetic capacity and fatty acid production in microalgaes». Ikumi Umetani har til forsvar for graden philosophiae doctor (ph.d.) ved Universitetet i Sørøst-Norge (USN), Fakultet for teknologi, naturvitenskap og maritime fag (TNM), innlevert avhandling med tittelen: Photosynthetic capacity and fatty acid production in microalgae. My PhD study discovered unique photosynthesis process in an oil-rich microalga, and potential of Norwegian microalgae for being sources for alternative food or green energy. Despite invisible existence, microalgae have enormous importance for our ecosystem. During my PhD study, I examined their two central metabolic processes; photosynthesis, which provides us oxygen, and fatty acid production, which provides us nutrients that we cannot produce by ourselves. We were interested in structure and process of photosynthesis in Nannochloropsis granulata for the adaptation to light environment. The marine microalgae, Nannochloropsis species are known for high omega-3 fatty acid contents, and they are candidates of commercial fatty acid production. By examining their photosynthetic apparatus, we found a molecular structure of light harvesting system connected to photosystem reaction centre. We analysed how light energy was used in the structure, and found excellent flexibility of their energy transfer processes in the response to light conditions. Their capacity of photosynthesis suggests successful adaptation of Nannochloropsis in highly variable light conditions. We were also interested in growing microalgae living in our local lakes and ponds for utilizing their fatty acids as our resource. Several green microalgae were isolated from the waters collected from Lake Norsjø, Lake Toke and Tårntjernet (a small pond at Jomfruland). We identified them by morphology and molecular analysis, and examined their fatty acid production. Their fatty acid profiles were typically rich in highly unsaturated fatty acids of 16 to 18 carbon chains. Their fatty acids have potential as food or animal feed sources. Also, this typical fatty acid profile was altered by nutrition. The alternate fatty acid composition showed suitability for biodiesel application.